서울의 의료기관 수는 지난 25년간 계속적으로 증가하여 2005년 현재 총 13,319개의 의료기관이 분포하고 있다. 의료기관의 확충과 더불어 병상당 인구수와 의사 1인당 인구수도 감소하여 서울의 의료서비스 수준이 지속적으로 개선되어왔음을 알 수 있다. 의료기관의 공간적 분포를 살펴보면 대규모의 종합병원과 병원이 일부 도심지역과 강남권에 지역적으로 편중되어 분포하고 있어서 의료서비스 접근성의 문제가 여전히 존재하고 있음을 알 수 있다. 특히 치과와 같은 특정진료과목의 병원분포는, 지역적 편중성 문제가 심각하게 나타나고 있다. 구별로 한 개소씩 설치되어 있는 보건소는 노인이나 저소득층을 대상으로 한 보건서비스를 제공하여왔으나 최근에는 지역사회를 대상으로 한 지역보건사업의 구심점으로서의 역할이 확대되고 있어서 이들의 기능을 뒷받침해줄 수 있는 지역자원, 특히 지역의료기관 연계의 중요성이 강조되고 있다. Seoul’s medical institutions continued to increase over the last 25 years, totaling 13,319 in 2005. 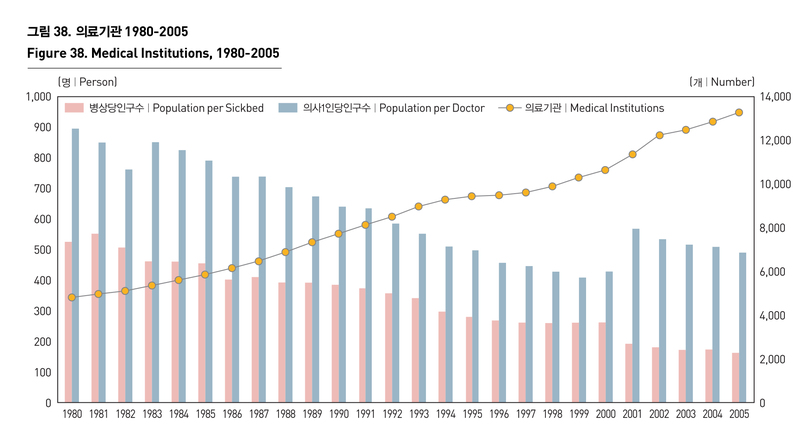 Combined with the expansion of medical institutions, the decline in the number of population per sickbed and population per doctor led to steady improvements of medical services. 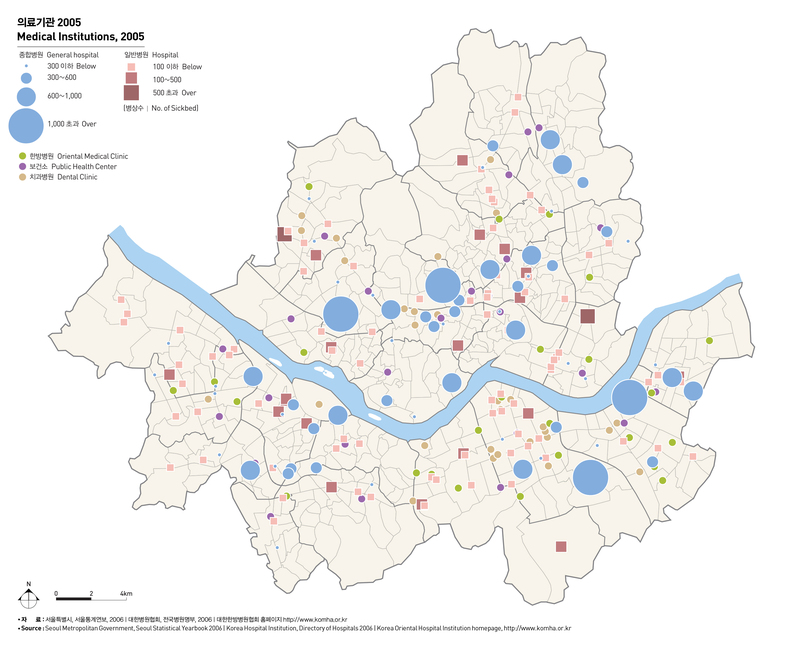 Many of general hospitals and clinics are located in some downtowns and the South of Han river, which indicates that the problem of access to medical services has not been properly addressed. In particular, the problem is more acute in some hospitals including dental clinics. Public health centers installed on the basis of a district once provided health services to the aged or low income brackets, but they came to play a pivotal role in public health programs in the community. In an effort to support their function, the importance of linking them with regional medial institutions has been emphasized.